Isaac Sidney "Sid" Caesar was born in Yonkers, NY to Jewish parents. His folks owned a restaurant. Caesar started his career at a very young age when he learned to mimic the accents of customers while he waited tables. 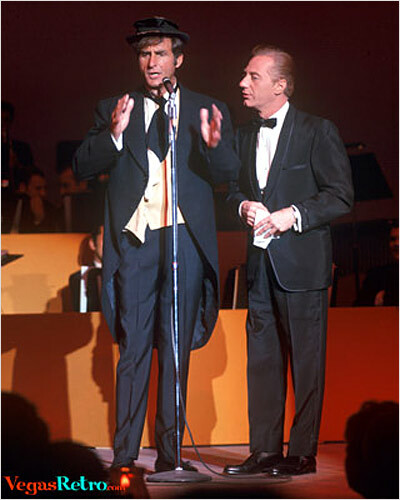 Although he pursued a career in music, his talent for comedy won out and he became an instant star in 1950 with a comedy/variety show called "Your Show of Shows" and won his first Emmy in 1952. This photo was taken at his show in Las Vegas in 1967. Anyone know who the strait man is? Howard Morris, maybe? Let us know in the comments below if you recognize him.